Quilts of Valor is a pre established non-profit outreach that the Helping Hands Quilt Guild participates in to provide the warmth and comfort of a quilt to those in need. We make bed size quilts for the men and women who have served in the military and the families of those who have passed in service. A contribution to “QOV”, as Quilts Of Valor is affectionately known, enables us to continue our work of love for our country and those who service. All donations are tax deductible, and we welcome donations of supplies as well as monetary contributions. 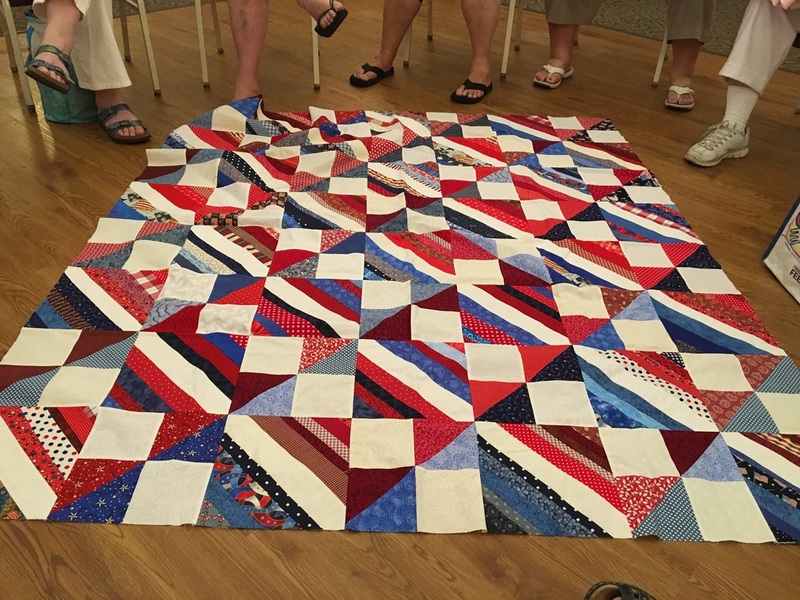 Donated material should be cotton and have a patriotic color scheme; Red, White, and Blue fabrics are the colors used to create these quilts. For any of those who can not participate in a meeting, please find attached the pattern used to make a QOV. The pattern is also shown as the image to the right. If you would like to make a nomination for someone to receive a Quilt of Valor, please complete the nomination form below and submit it to Nancy Thomson at a meeting or via email, nancy.thomson@qovf.org. During the workshop, participants are able to work on blocks and take material home to finish what was started. Block instructions are available from Betty Rigo.